I know I can fix this using css but it seems more appropriate to fix the template but I can't see how. 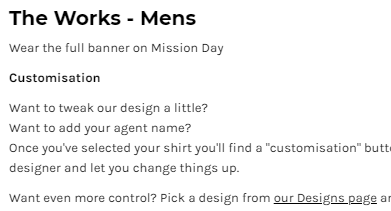 When I visit missionday19.secure-decoration.com/shop/product/10847392 the size of the links and lists get mucked about. This is because the templates all open an H2 tag at the beginning of the description and the editor doesn't let me close it and the browser doesn't compensate - because clearly <H2><P> is broken and it could help out. I've changed the theme and each theme seems to use the same "view" or "element" for displaying that portion of the page within the full template. If I use Chrome Developer Tools and remove the <h2> the text then looks as it should. So, how do we edit the "view" or "element" to remove the malformed html? awesome @ccruz - is there an auto-update feature (à la WordPress) or do I have to lean on the printing company we're using to update? Our updates apply automatically once released; nothing for you to do on your end. The update should be pushed out in the next couple days. I'm very impressed, my site is updated already. Thank you.